It’s not at all surprising that Phoenix TV station KPHO is running an ad poking plans by Gannett properties The Arizona Republic and KPNX-TV to charge for online news (I would embed it here, but embedding has been blocked on that one). What’s surprising is no other TV station in a competitive market has run such an ad (as far as I know). The ad claims that KPHO’s website has “even more” information than the Gannett site, azcentral.com, which sounds patently ridiculous on its face — but how many people who aren’t devoted daily newspaper readers know that? I know some devoted newspaper folks whose first instinct when local news breaks is to go to the leading TV station’s website, not the newspaper’s site. This ad just takes aim at that type of impulse and seeks to build on it. It is the leading argument in my mind for why no news site should be 100 percent behind any sort of paywall. If you have competition that’s free, you need to offer at least breaking news, something to keep them coming to you for free so that you can then attempt to lure them to pay for your fuller coverage and extras. 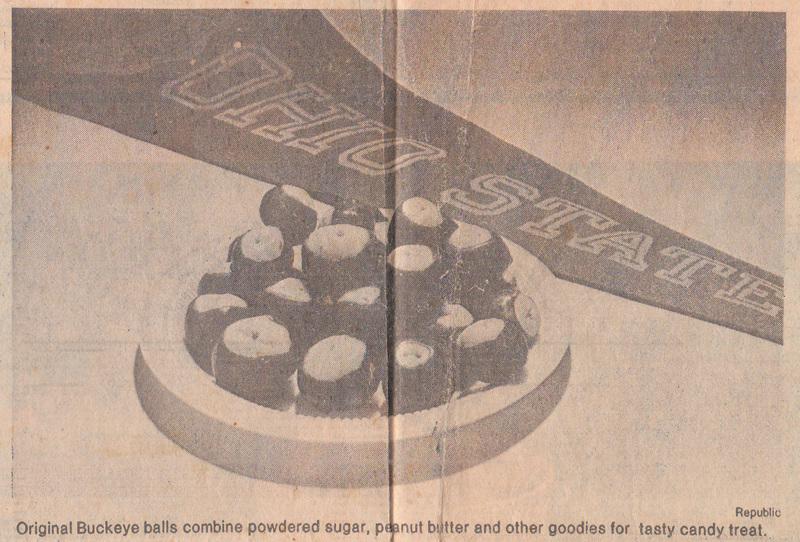 Going through a huge box of my mother’s papers — personal, financial and some of her newspaper clips — I came across a column she wrote for the Arizona Republic in 1983 (under the byline Gail Tabor) claiming to be the person who first made a dessert that became popular among Ohio State fans, Buckeye Balls, which are peanut-butter balls dipped in chocolate with just a circle uncovered on the top so they look like buckeyes. A portion of the clipping was torn, and the whole was too long to fit on my flatbed scanner, so I’m typing in the text below. Note that if you try making them, the key in the recipe is “6 or more tablespoons peanut butter.” You start with six, then keep adding peanut butter to taste. Had it not been for me, you wouldn’t have the pleasure of gorging on those mouth-watering, chocolate-covered peanut-butter-flavored morsels. As is so often the case concerning valuable and coveted items, the recipe was claimed by a conniving woman from Oklahoma. She fibbed and said it was hers, after promising me under oath that she would never let that recipe out of her hands. 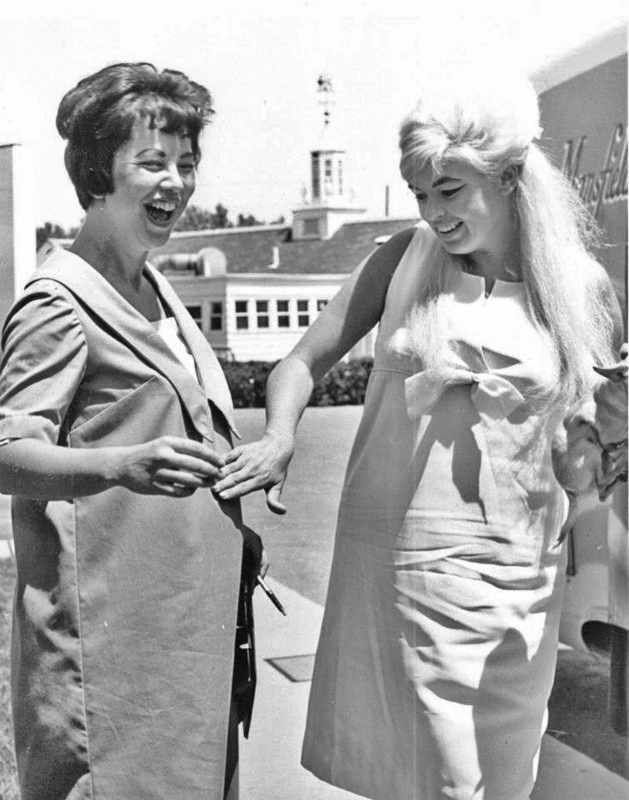 Not only was she a dishonest purloiner, she instilled in me a deep distrust of everybody from Oklahoma, a fault that stays with me to this day. It all began in 1964, when I married a rabid Ohio State fan whose idea of fun was sitting in the rain and snow watching football games. Oh, those memories: Finding the seat, wrapping sock-and-boot-clad feet and legs first in plastic, then in a layer of newspapers, and covering everything with a blanket. You didn’t dare move an inch the rest of the game for fear of disturbing the wrappings and letting in the cold air. Thus it was christened. We gave batches away to friends, and they fell in love. “How did you make them?” they would beg. But I was selfish and refused to part with the information. I wanted to be the only one in the world to have the secret of making candy-lovers happy. In 1971, ex-husband graduated and we moved from Ohio. Before we left, the wife of a man who studied with my ex, and who was also graduating, pestered me unmercifully for the recipe. “We’re returning to Oklahoma, and you will still be the only one over here who knows how to make them,” she said. “I promise I’ll never tell anyone else. Please, please, please,” she said, or words to that effect. All I know is, she pledged a solemn oath to keep her mouth shut. I relented. Dates get fuzzy in retrospect, but it may have been 1973 when a visit was paid to Columbus during football season. Imagine my surprise when I picked up the local newspaper and saw an entire story on Buckeye balls. How in the world, I wondered, did somebody else figure them out? Furious is an understatement. I felt deceived, betrayed, put-upon, hornswoggled and just plain enraged. I swore revenge. This year, I was in Columbus on assignment when the big day rolled around. While Ohio State and Michigan were slugging it out, I met a friend for lunch and moaned over another tradition going down the drain. This year, the making of Buckeye balls would be delayed a week. So now you know. Today, and forevermore, as the scrumptious little bites disappear into eager mouths, bow to the West and give thanks to the woman in Phoenix (certainly not Oklahoma) who made such joy possible. Combine first four ingredients, adding a bit of milk if necessary. Rolls into small balls. Melt chocolate chips and canning wax in top of double boiler. Make sure chocolate and wax are mixed well so wax doesn’t rise to the top. With toothpick, dip the balls into the chocolate, but do not cover completely. Chill in refrigerator. After chocolate is hardened, store candy in plastic bags in freezer. This is off the usual topics for this blog. Obituaries are completely out of the control of most newsrooms, so my intended audience — journalists — can do nothing about this complaint. But having dipped into the obituary pool Friday after my mother died, I can report with great authority that on this part of their business, this nation’s newspapers are practically lying naked across a table, eyes closed, holding a sign that says, “Whatever,” waiting for a madman with a knife to come along. If you have never made arrangements to place an obituary, let me assure you: It is messy, and it is EXPENSIVE. It is everything, in fact, that begs for someone to come along offering a simpler, easier, cheaper solution — an idea that was introduced to the news industry years ago as a job to be done. But of course no one really wants to make it cheaper, because that would reduce revenue. I remember once hearing a publisher gripe about a company-imposed mandate to simplify and beautify classified ads; the end result was a better-looking (bigger type, more photos), more enticing page that offered more options to people placing the ads, but the ads were bigger without the price going up, so revenue per ad was lower. Focusing on that is just short-term thinking — the number of classified ads has been dropping like a rock for years, driven by free online ads, so the intent of the change was to try to improve the printed ad experience and stem the decline, and maybe entice more people to come back. If you’re constantly watching your back, trying not to lose more ground, you can’t go forward. Almost two years ago, Steve Buttry pointed out the problems and opportunities in the obit business. He was right then, and he’s righter now. But it’s even worse than I knew when I read his post in 2010. I attempted to place my mother’s obituary in five newspapers — in the town where she was born, in the city where she began her journalism career, in the city where she retired, in the city where she lived for 10 years before a heart attack changed her life and mine, and in my own city. One told me that obits had to come from a funeral home, not individuals, which is a barrier because I’m not using a funeral home; my mother is being cremated by the Cremation Society of Virginia, which told me to handle the ads myself. I explained this but was told the ad had to come from a funeral home. So, one paper gets no ad. The cost at the other papers ranged from around $300 to nearly $500 (in my own city, the ad was free because I work for the company — an excellent employee benefit but one you hope never to use). In the accompanying listing for each at legacy.com (yes, each one has a separate, unlinked listing), my mother’s name appears as Anita Lucas, even though she never went by Anita — like many people, especially in the South, she went by her middle name, Gail — except for one listing: the obit placed in The News & Observer of Raleigh. The News & Observer also was the only one that had a completely web-based system for placing the ad. It was easy and seamless. Every other place had me e-mail in the information, and they called me back to get credit card information. Not bad, but not seamless. When the day comes that someone actually does this, newspaper executives won’t be able to say no one saw it coming or tried to warn them. 5/21 UPDATE: Through Twitter, legacy.com noticed my complaints and addressed its end of them, so her obits now appear online as Gail Lucas, and the guest books have been combined.